After a tumultuous journey, our four heroic hobbits, Frodo, Sam, Merry, and Pippin, finally find themselves back in the Shire at the local tavern, each with an ale in hand. All around them, Shirefolk are laughing and carrying-on, but the four hobbits quietly sit around a corner table looking at each other and saying nothing. They are experiencing the loneliness of a profound shared experience that leaves nothing left to be said between its participants and nothing that can be told to an outsider that will adequately convey the events that have taken place. Each has seen the strengths and weakness of the others and themselves, and this knowing tightens the bonds of friendship. It is a moment that needs no spoken words, but it is also a moment that cannot last. Eventually, the time comes to raise the glasses at the unspoken words and re-engage. This moment comes for the hobbits and each is soon following their new paths in life, but not without the lasting bond of their shared adventure. Fortunately, NAAMES has not required us to cross middle-Earth, fight impossible battles, and cast a cursed ring into the fires of Mount Doom, but I believe that, beyond the science accomplished, it has created bonds of friendship linked by a common experience. Perhaps it is here that the greatest value of NAAMES can be found. Like the hobbits, we will soon arrive at the shire of Woods Hole and meet together for a final celebration. As at the end of the first three NAAMES campaigns, I expect this final celebration will once again be similar to the above described scene from Lord of the Rings. We will be a group of friends celebrating a common adventure that those outside our group cannot fully understand. We will share stories, relive particular moments, appreciate each other’s company, and raise a glass to a wildly successful cruise and mission before we all depart to reintegrate into our separate lives back home. Beyond this, I believe there is little left to say other than to extend my personal and profound gratitude to all the loved ones back home who have follow our blogs and waited for us to return safe from the sea, to the captains and crew of the Atlantis and the shore support at WHOI who have made the NAAMES campaigns possible, and to all the scientists involved in NAAMES who have enabled this mission to be successful beyond my wildest dreams. I simply cannot wait to see and read about all the new insights gained from our work as it emerges over the final year and a half of the NAAMES project! often shifting within short periods of time. but they come and go. an invitation for an embrace. But the next morning brings howling winds that bites at my bones. driving me to seek some semblance of safety inside the ship. is actually a small thimble in a vast desert expanse. are all subject to the passing moods of the ocean. All that we can do is roll with it. on what we had planned on doing. Wise not to become too attached to plans when voyaging the high seas. best to change course before getting caught. but new opportunities are presented. We’ll uncover who, how, and why. or maybe what has already taken place. It’s hard to really know. as long as the ocean allows. To pay heed to its emotions is to respect it. Only then do opportunities arise to learn from it. Sunset over the ocean, as viewed from the deck of the R/V Atlantis. 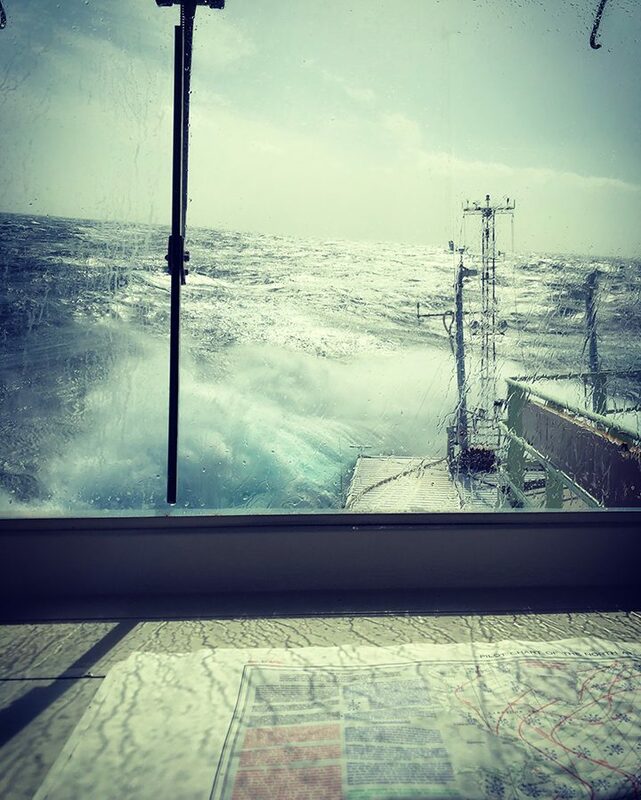 As we are transiting back to Woods Hole, a calm and fresh atmosphere can be felt in the mood of the ship’s life. People start asking all sorts of questions about the first thing you will do on land, as a nostalgic reflection of the things that we miss. We have left behind the rush of the intense science days and a space for contemplation and thinking opens. 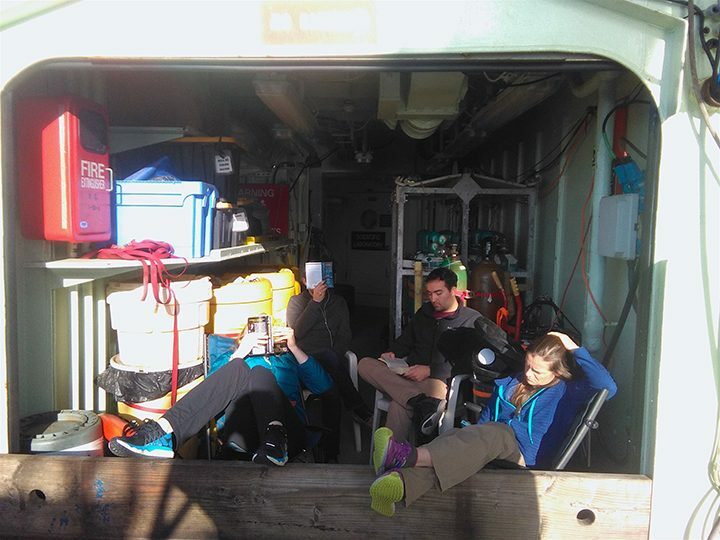 Although some of us keep sampling during the transect, this is the time to read the books that were carefully selected before the cruise while we enjoy surfing the waves and sunlight. 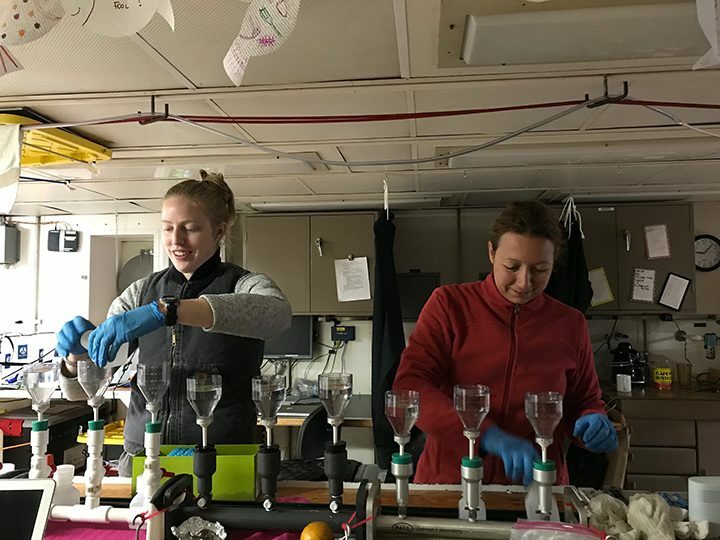 Calm in the labs can be suddenly disrupted by a “pilot whales on starboard side” shout, followed by a stampede of eager scientists carrying their cameras running towards the ship’s bow. 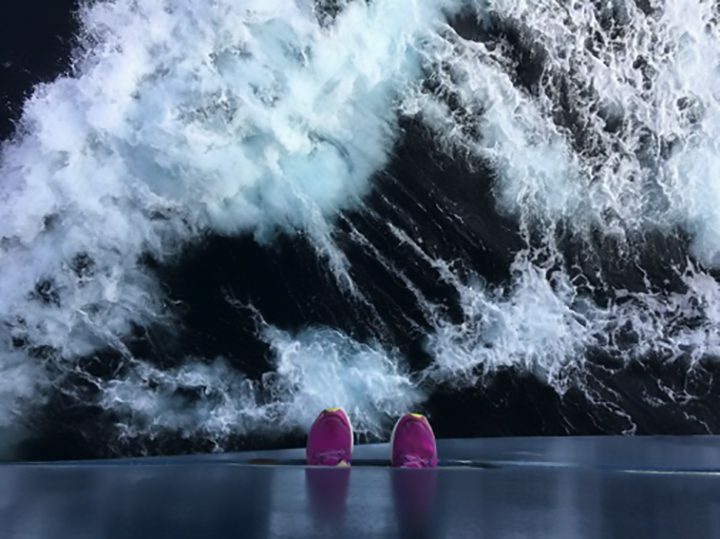 Most of the times it’s difficult to spot them in the vast oceanic blue and the only shot that we have is that of a big wave splashing the ship’s front, which is awesome by itself (no complaints). This free time led me to write on this blog about a frequent question asked by family and friends; what do you do in your spare time aboard? Unless you have been in a research vessel as the Atlantis, it’s difficult to have a picture of what it means living at sea. Each shipmate has it’s own way to spend free time, so I will write about some of the most popular activities. TV room and library: dynamics in the TV room are quite intriguing during the day. You can see sporadically one or two shipmates hanging around without paying attention to the TV. During lunch and dinner this room gets crowded and people enjoy their meal while watching a movie. Both spaces are famous due to the presence of the popular “blue comfy seats”. Blue comfy seats are present also in the library and have become a highly demanded luxury during science meetings. People even start occupying them as long as 20 minutes before our daily gathering, reminding me those concerts where you got early to get the best spot. Most of the time, library is occupied for working, reading, and napping. Board games in the mess: this is other popular activity that takes place usually after dinner and sunset. Some games can go very late. Launching meteorological balloons: yes, this is a very fun activity. During good weather you can collaborate launching balloons from the O2 deck. This activity has become a highly competitive sport during this campaign and rumors say that even chocolate and chips are being bet to the balloon that reaches the highest altitude. Participants require a set of skills involving grace, wind control, strength, and lots of luck. Reading: as mentioned before, reading is one of the most popular pastimes in the cruise. During sunny days, you can see people sitting in the aft deck enjoying the sunshine and their favorite books. Naps and reading have had a huge improvement this year due to the presence of the most comfortable beanbag. Caitlin, Bryce, Eric and Ali enjoying a morning reading. Notice how books can have a double function. Watching sea creatures (from micro to macro): this activity includes all sizes of creatures. 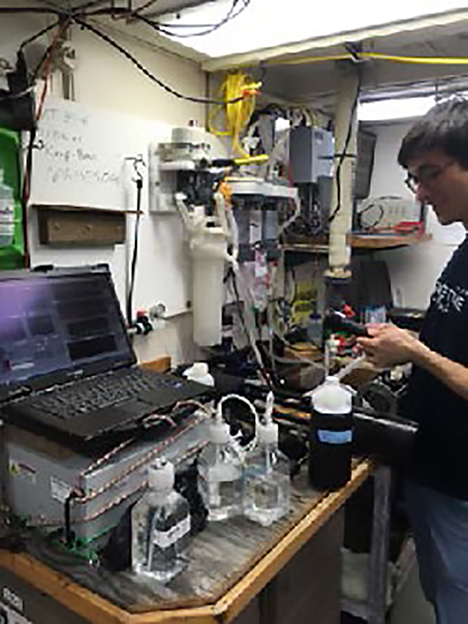 We can spend hours watching the pictures of microorganisms retrieved from the Inline Flow Cytobot. As you can imagine, we always are paying attention to the ocean and trying to spot whales, dolphins, birds and any other creature that decides to show up and say hi to us. 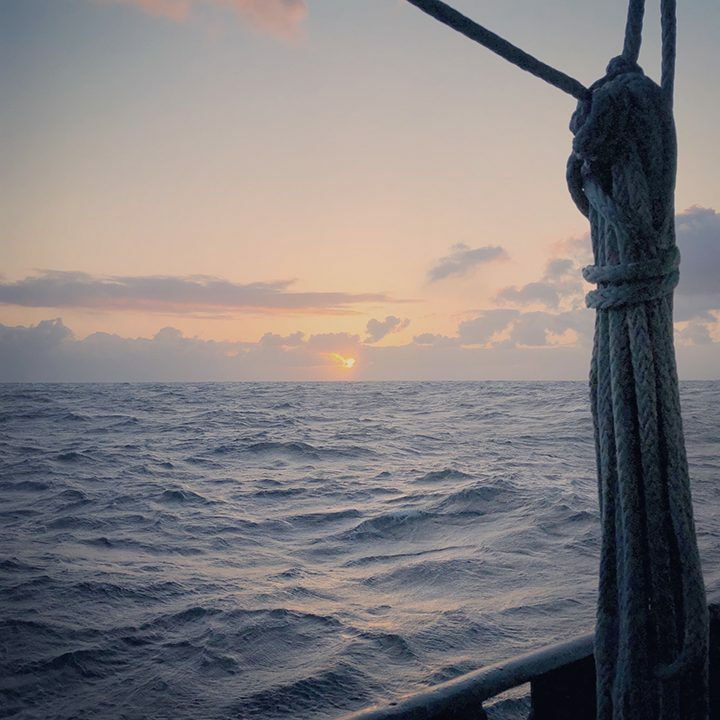 Sunset and sunrise: most of our lives aboard are determined by meals and sun cycle. Sunrise and sunsets are simply amazing. Watched from the middle of the ocean, there’s always a new beautiful picture to take. Even more, some kind of ritual has been established. I had never heard so many times “My heart will go on” by Celine Dion. Writing this, I realized how lively NAAMES has been and how lucky I’m for having the opportunity to share the passion for science and ocean with an awesome group of people. 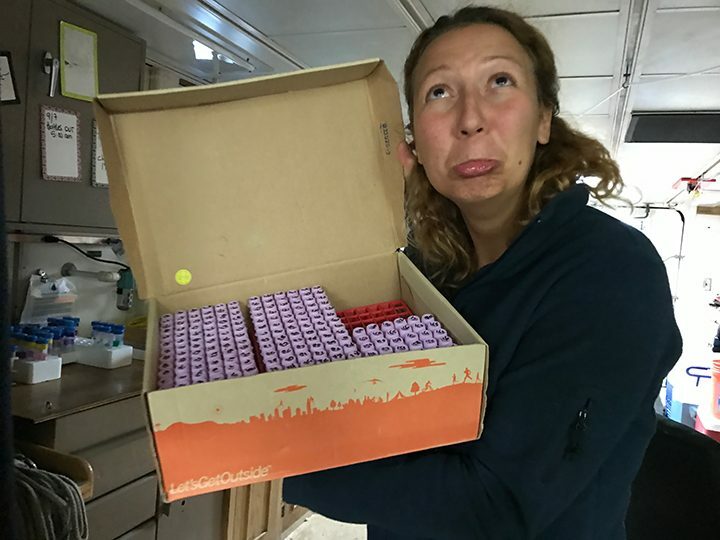 As the last NAAMES field campaign is coming to an end, I can only thank the Atlantis research vessel crew, the science team, and the people in charge of logistics for making of NAAMES a wonderful, successful and enriching experience. Dim the light in the main lab, and draw the black curtain! This is the time for the daily after-dinner excitement! 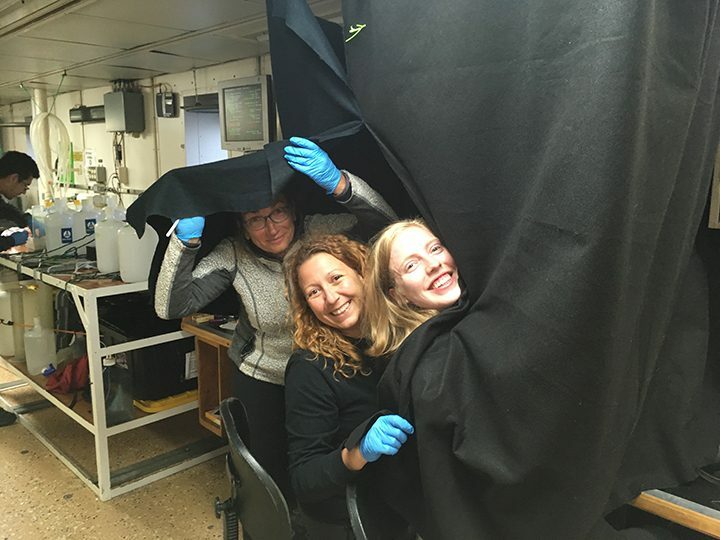 Except that the only thing that really gets excited during those evening sessions is the chlorophyll that my two teammates and I are getting ready to measure! We, on the other hand, are not too thrilled when facing the 204 tubes that need processing. Considering that our day started with the 2 am cast, and that so will the next day, even with a short afternoon nap, we want the night show to be as short as possible. Gayantonia making a face at the tubes to be processed. Reading all these chlorophyll tubes represents the last step in our experimental work. Each morning we bring in the bottles containing the seawater that we incubated for 24 hours, and we take water samples from each bottle. We then draw out the phytoplankton and collect it onto a filter (We do the same with the water before it goes into the bottles). The filter is inserted into a test tube containing ethanol, a reagent that will extract the chlorophyll from the phytoplankton cells during the next 12 hours. The change in chlorophyll during the incubation provides estimates of the rates at which the cells grow and/or are being eaten by other plankton. So, reading the chlorophyll is an essential conclusion to the experiments, yet it is a tedious task: Insert a tube into the machine, wait for the instrument to settle on a number, write it down, add 2 drops of acid into the tube, read it again. Repeat. Two hundred and four times! This has to be done under low light, as light can quickly degrade chlorophyll. To isolate the reading station from the light from the lab, we had to be creative, and so we fashioned a makeshift cubicle out a black cloth suspended from the ceiling like a curtain around part of a bench. Before we can proceed to the reading, we have to remove the filters from the tubes, which can add up to the time spent on the chore. Only one person at a time can read the instrument, but we quickly figured out that we could save a lot of time if the two others removed the filters while the third person started to measure. So the three of us huddle together inside the booth. Stepping inside the cubicle inevitably starts a childish giggling brought about both by the comical situation and the need for sleep. All of a sudden, our behind-the-curtain togetherness and the jokes and stories we share inside our black curtain hideaway transforms chlorophyll reading from tedious to fun… well, at least for a while. Being silly behind the curtain. Photo credit: Ben Diaz.